The HP Elite x2 delivers excellent productivity thanks to a smart design and essential Windows 10 features like Cortana in a package you can take anywhere. 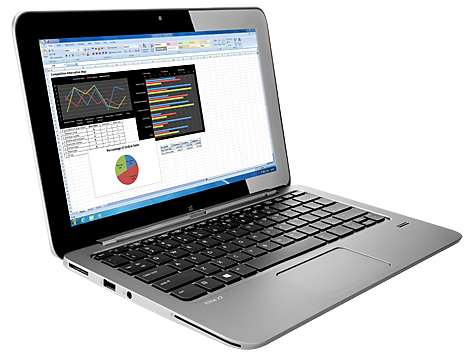 HP’s hybrid offers a reasonable selection of features, a comfortable keyboard and class-leading battery life. However, with it suffering with the usual hybrid pitfalls, I'd be tempted to spend the money on a dedicated notebook and tablet to get the best of both worlds – without the compromises. Considering the HP Elite x2 1011's durability, it's not as bad as my assessment might read. Rugged laptops and tablets typically cost thousands of dollars and they're ugly as sin. The Elite x2 sits somewhere between one of these awful rugged tablets and a pretty consumer device like the Surface Pro 3. So, yes, it's a bit heavy, but it's also Fort Knox-level sturdy. If you’re after a business-focused hybrid laptop, the Elite X2 has plenty of office-friendly credentials and display quality is the only real blemish on an otherwise capable machine. It’s a great choice for a run-all-day work laptop, but if you’ll be spending more time in tablet mode you should consider the cheaper Microsoft Surface 3 instead. Positive: Good build quality and ergonomics; decent performance; very good battery. Negative: Thick and heavy; expensive. Positive: Quality display; comfortable backlit keyboard; excellent battery life. Negative: Very small opening angle; buttonless large touchpad. 5Y51: Broadwell-based ULV dual-core processor for tablets and 2-in-1 notebooks. Offers an integrated HD Graphics 5300 GPU and is manufactured in 14 nm.» Further information can be found in our Comparison of Mobile Processsors. 76.2%: This rating is not convincing. The laptop is evaluated below average, this is not really a recommendation for purchase.